To protect the Mekong Irrawaddy dolphins from extinction, WWF-Cambodia has been working hard to engage community members in educational workshops since 2005 in the Mekong Flooded Forest landscape (MFF) - and 2017 is no difference. There are still only around 80 dolphins in the Mekong River and human-induced environmental pressures such as destructive fishing practices, large infrastructure projects, pollution, and loss of habitats mean that threats to the dolphin population are always present. Protecting the dolphin population is paramount as it supports, and is supported by, a diverse and interdependent ecosystem. Community members complete this ecosystem which helps the MFF landscape thrive, maintain its fertility, and continue to provide fundamental ecosystem services. On 14th – 17th June 2017 in Kratie and Stung Treng provinces, two provincial assistants, a freshwater project officer, and an awareness and outreach assistant visited eight villages in five communes with the objective to deliver interactive and educational meetings on the Irrawaddy river dolphins. The focus of the meetings is on dolphin identification, responsible fishing practices, fisheries law, legal protections, alternative livelihoods, and how not only threatened but highly important the dolphins are. After the main meeting, a competition ensues where those with their new knowledge are invited to volunteer in a quiz, which never fails to generate lively discussions and encouragement from their friends and family. To show appreciation for their involvement, participants receive information packs and WWF resources to take home. Participant demographics are important, and efforts are made to target fishermen and women and the youth population who will be the next generation working on and around the Mekong River. While mostly women and young people attended the workshops, due to rice harvesting season, word of mouth is a powerful tool and the distributed educational resources utilize that. The progress of village meetings is evaluated through the engagement in the pop quiz and recording of number of participants compared over time. Overall, 367 people (including 194 females) are reached over four days, which is encouraging and an indication of successful engagement and public awareness. 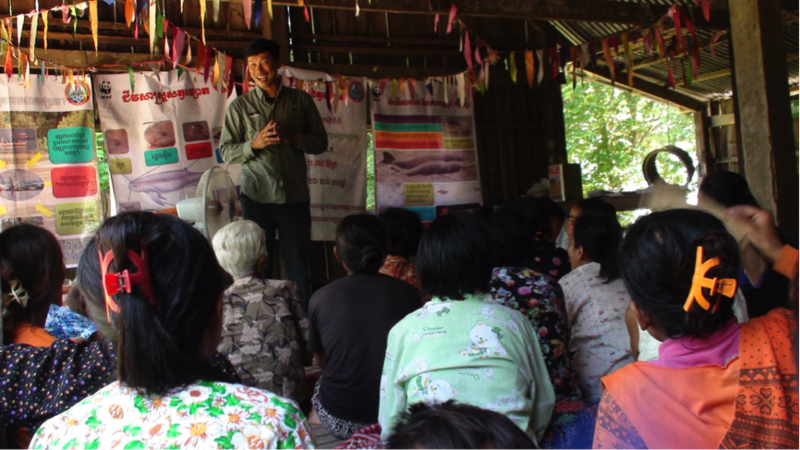 This reflects a recent WWF-Cambodia report on Mekong River community knowledge and attitudes, which revealed that village meetings are the second most popular way that information is circulated. Attendance numbers are a primary indicator for measuring immediate outcomes for MFF outreach activities, and what we are seeing so far is very positive. Beyond the immediate outcomes, the longer-term goal of the meetings is behavioral change in those who attend. Although, a baseline survey is still to be conducted, observational estimation puts the behavioral change rate at around 70%. Freshwater Program Officer, Mr. Lor Kimsan, reflected on the importance of our outreach activities: “I think village meetings on the Irrawaddy dolphin are fundamental and we want to explain to them the importance of dolphin conservation”. Outreach activities through public awareness will continue in Kratie and Stung Treng province as a central support function for our Irrawady river dolphin project.